The social safety net became more generous under Presidents George W. Bush and Barack Obama, and as a result massively altered employment patterns in the labor market. I have explained in previous posts how public moneys have recently been used to help the unemployed, the poor and the financially distressed endure the recession, but at the same time have dramatically eroded incentives for people to maintain their own living standards by seeking, accepting and retaining jobs, as well as incentives for employers to create jobs that are attractive to workers. My forthcoming book “The Redistribution Recession” (see the introductory chapter online) quantifies those incentives and their changes over time in terms of marginal tax rates, which refer to the extra taxes paid, and subsidies forgone, as a result of working, expressed as a ratio to the income from working. As a result of more than a dozen significant changes in subsidy program rules, the average middle-class non-elderly household head or spouse saw her or his marginal tax rate increase from about 40 percent in 2007 to 48 percent only two years later. Marginal tax rates came down in late 2010 and 2011 as provisions of the American Recovery and Reinvestment Act expired, but still remain elevated – at least 44 percent. Americans have different economic and family situations, and subsidy program rules are complex. As a result, the marginal tax rate changes for particular households vary significantly from the average eight-point increase. A few households even saw their marginal tax rates jump beyond 100 percent – meaning they would have more disposable income by working less. Marital status and skill (that is, what people are capable of earning) are important determinants of the marginal tax rate and its changes over time. Married people saw their marginal tax rates increase less than average, because even when out of work they are likely to be ineligible for a number of antipoverty programs because of amounts earned by their spouse. Skilled people saw their marginal tax rates increase less because a number of the new subsidies were fixed dollar amounts, and a fixed dollar amount is a lesser fraction of what a skilled person can earn than it is a fraction of what an unskilled person can earn. One way I tested, and rejected, the Keynesian assumption was to compare work-incentive changes and work-hours changes between 2007 and 2010 across 10 demographic groups differentiated according to their skill (five categories) and marital status (two categories). In the Keynesian view, the two changes would be correlated only by coincidence. The group-specific incentive changes are measured (most recently in my paper “Recent Marginal Labor Income Tax Rate Changes by Skill and Marital Status“) on the horizontal axis in the chart below as percentage changes in the share of what people keep from what they earn, net of taxes paid and subsidies forgone. 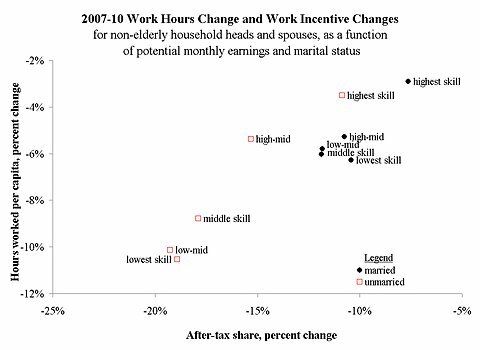 For example, work incentives were eroded about 20 percent for unmarried household heads (red squares) in the middle of the skill distribution, while they were eroded about 12 percent among married heads and spouses (black circles) with the same level of skill. The vertical axis of the chart measures the percentage change in hours worked per person, most of which is due to increased unemployment rates. Each tick on the vertical axis is 2 percent, which makes each tick as large as some recessions. Among unmarried people, hours worked tended to fall more for the less-skilled groups. I explain this result as a consequence of greater incentive erosion among less-skilled unmarried people compared with more-skilled unmarried people, but others have suggested that less-skilled people experience greater demand changes during recessions or otherwise have behavior that is more sensitive to economic conditions. Remarkably, the same skill pattern does not hold up among married people. All but the top skill group have essentially the same hours changes and are uniform in terms of their incentive changes. Also remarkable are the huge differences by marital status between hours and changes and incentive changes. For example, the married people in the lowest skill group saw their work hours fall about half of the drop for unmarried people with the same skill, which lines up with the huge difference in their incentive changes. Keynesians can explain different labor-market experiences by demographic groups to the degree that groups differ in their propensities to work in declining industries, except in this case marital status has very little correlation with industry of employment. All of this makes sense to economists who think that labor supply still matters, because groups facing the same demand for their labor can nonetheless have different labor-market outcomes because of their varied supply situations. The fact that marginal tax rates rose so differently for various groups means not only that redistributive public policy depressed the labor market but has also sharply, and arbitrarily, altered the composition of the work force in the direction of people who are married and more skilled.